Top scorer Marc McKenzie was the most prolific winner when the Cowdenbeath FC official supporters club made their annual presentation of prizes for the 2012 championship-winning season at Wee Jimmies bar. Cowdenbeath FC Supporters Club Player of the Year (Central Fife Times Trophy) - 1 Joe Mbu 2 John Armstrong, 3 Marc McKenzie. Supporters Club Young Player of the Year (John Finlay snr Memorial Trophy) - 1 Dean Brett, 2 Thomas Flynn, 3 Thomas O'Brien. Players' Player of the Year (Eric Mitchell Trophy) - 1 Marc McKenzie. 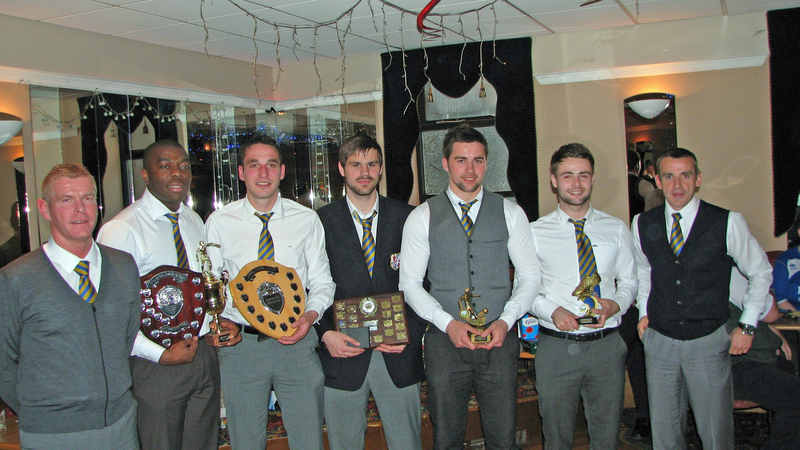 Fans' Player of the Year (Junction Bar Trophy) - 1 Marc McKenzie, 2 John Armstrong, 3 Joe Mbu. Top League Goalscorer (Hookey Leonard Trophy) - 1 Marc McKenzie 18 goals, 2 Lewis Coult 13 goals, 3 Greg Stewart, Mark Ramsay, Jordan Morton 6 goals. Best Individual display (The Pollock Shield) - 1 Lewis Coult (hat-trick v Stirling), 2 Thomas Flynn (2-0 win at Stirling), 3 Joe Mbu (v Dumbarton). Goal of the Season (One Stop Mortgages Trophy sponsored by Chic Robb) - 1 (equal) Jordan Morton (v East Fife) and Jon Robertson (v Hibs), 3 Greg Stewart (v Hibs). Supporter of the Year (Lord Ewing Shield sponsored by the BLCC) - Darren Adamson and Stuart Watson. Supporter of the Season - Darren Adamson. Midfield dynamo Mark 'Mini' Ramsay was the main man for season 2010/2011 when the annual Blue Brazil awards ceremony was held at the Cross Guns public house in Cowdenbeath. A packed audience, including chairman Donald Findlay and manager Jimmy Nicholl, erupted into tremendous applause when Mini was named as the winner of the coveted "Players Player of the Year" trophy. He also collected the "Best Individual Performance" award for leading the amazing four-goal comeback at Stirling and also the "Goal of the Season" trophy for a spectacular overhead kick which was applauded by everyone in the ground at Greenock. Mini said he was a wee bit miffed he did not collect the "Top Scorer" trophy as well, claiming he was only one goal behind with several games yet to be played. Still, he was all smiles when the raffle was drawn as he lifted three of the major prizes in that as well. Greg Stewart collected the leading scorer prize as well as the "Young Player of the Year" award while veteran assistant manager Colin Cameron took the Junction Bar "Star Player" trophy. One of the biggest cheers of the night was reserved for Craig 'Toorie' Winter, picked as the Cowden Supporters Club "Player of the Year" based on the weekly votes counted at every game, home and away. Toorie is a previous winner of the fans trophy - a mere 13 years ago - and has been a star man in several different positions during the season. Finally, the "Supporter of the Year" award deservedly went to Alex Haddow for his tireless efforts on behalf of the club throughout a difficult season.